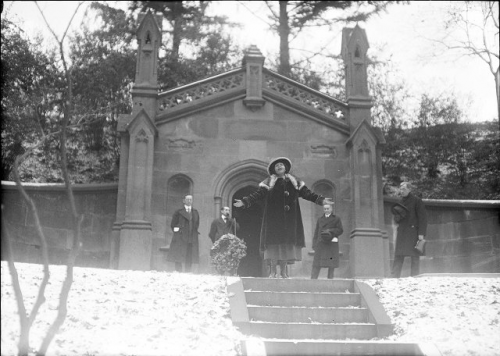 Miss Elsie Elm, an Oneida, sings the funeral dirge in her native Oneida language at the Lewis Henry Morgan tomb in 1920 (?). Stone, Mr. Albert R., courtesy of Rochester Museum & Science Center. Morgan bequeathed not only his library and papers to the University of Rochester, but also his estate, which he earmarked for the creation of a women’s college. At the University, however, there were no memorials to Morgan until a wing in the new Women’s Residence Halls was named after him in 1955. (The dormitory was later named for Susan B. Anthony.) In 1963, an annual lecture series named for Morgan was created by the Department of Anthropology. Morgan is buried in Mt. Hope Cemetery in a tomb that he designed after the death of his two young daughters from scarlet fever while Morgan was conducting fieldwork west of the Mississippi River in 1862. By contrast with his contemporaries Frederick Douglass and Susan B. Anthony, Morgan is not well remembered today in Rochester. A primary school in the 19th Ward named after him closed in the 1990s. In order to provide durable resources to all project partners, the project will involve the construction of a website that will document the activities connected with the project and the creation of a digital exhibit based on the exhibits at Rush Rhees Library, RMSC, and the Rochester Public Library. The design and implementation of these digital products will be carried out in collaboration with staff at the Digital Scholarship Lab at the University of Rochester and the partner institutions in this project. The digital platform for this project is currently under construction. The first stage of our website is estimated to be launched by mid October, 2017.